Wunderbar sums up the civilized Germanic world where smooth and safe are a way of life… from excellent bike paths to timely trains and in between everything clean. We start in breathtaking Bavaria with her castles, beer gardens, and warm hospitality. Onto the laid-back wine region of Lake Constance, a sparkling gem of liquid crystal fed by the River Rhine. To easy biking in the Austrian Alps, greeted by fragrant forests, cowbell symphonies and lunches with locals. Switzerland sweetens the deal with creamy perfection as we explore her secretly guarded romantic side. Discover the place that inspired Walt Disney’s magic kingdom. This tour offers easy terrain on bike paths and bike lanes, and on roads in the neighborhoods and countryside in the Bavarian Alps and surrounding Lake Constance. Longer optional rides and some rolling hills on a couple of days offer fun for more avid bikers. This tour is ideal for both beginning and experienced cyclists. Our VBT support shuttle is always available for those who would like assistance. 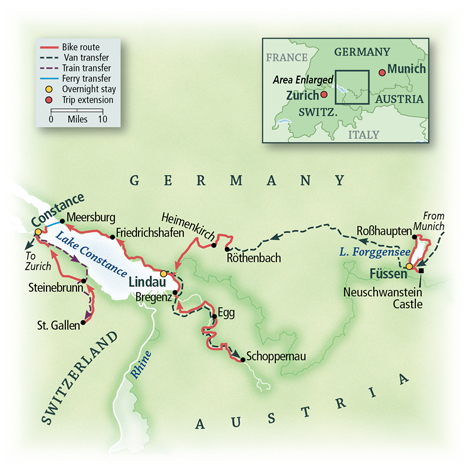 Cycle to Lindau via the "Bodensee-Königssee Bike Route"
Enjoy centrally-located hotels all towns with shops, parklands and lakeside views. Depart from home for Germany. The particulars of your arrival overseas are detailed with your flight itinerary and airline tickets. Arrive at Munich airport, where a VBT representative will meet you and help you transfer (approximately 40 minutes) to your centrally located hotel. If you arrive early, your hotel room may not be available until 2:00 p.m. You may store your luggage with the reception desk. The rest of the day is free for you to explore and dine on your own, using VBT City Information as your guide. VBT Air Package guests & Pre-Trip Extension guests: Meet your VBT representative and the rest of the group in the lobby of your Munich hotel by 9:00 a.m. for a prompt departure. Your VBT representative will be holding a VBT sign and will be easy to recognize. From Munich, transfer to the village of Hohenschwangau near Füssen (1 hour 45 minutes). Please bring your cycling clothes (including your pedals or saddle if you use your own) in your day pack, to change into before beginning the warm-up ride. Meet your VBT Trip Leaders at approximately 10:45 a.m. in the village of Hohenschwangau near Füssen. From here, hop on the local bus (2 km) up to Neuschwanstein for your included 30-minute guided tour of the castle. Afterwards, return to the village by local bus and shuttle to your hotel in Füssen. Enjoy an included light lunch before your bike fitting and warm-up ride. Please note that check-in time is 4:00 p.m., and your room will not be ready. You will be able to leave your bags with the reception desk. Afterwards, join your Trip Leaders for an introduction and safety talk. Then set off on a pleasant warm-up ride. Your first ride in this magical realm takes you to lovely countryside and a pristine lake, taking in breathtaking alpine vistas and coasting along charming narrow farm roads. Later, gather with the group for a welcome cocktail reception and dinner at the hotel. After breakfast, discover Füssen by foot with a local guide (45 minutes-1 hour). Then enjoy an invigorating reel through the scenic district of the region known as Eastern Allgäu. Marvel at views of the magnificent Neuschwanstein Castle, cycle around the shores of pristine Lake Forggensee, the largest in the Allgäu, and savor postcard-perfect views of the Bavarian Alps. For lunch, stop at Jürgen’s Panorama Hut for a buffet of locally cured cold meats and cheeses, served by our generous Bavarian host. Our longer option follows the 2,000-year-old Via Claudia, or “Emperor’s Road” from the days of trade between Venetian and alpine emissaries. You will find it’s a pure pleasure to cycle between the many mountain villages of Bavaria, each more charming than the last, punctuated by onion-domed steeples rising against a backdrop of emerald-green mountain slopes. This is truly a working farm region that carries on traditions from generations past. In September, a procession of 30,000 cattle return to the valley’s farm stables from the high mountain pastures of the Allgäu Alps, where they have been feeding all summer on high-nutrition grass and herbs that grow at higher altitudes. Still, you will no doubt coast past dairy cows with their tell-tale bells around their necks. After so many miles of enchantment, you may wish to swim in the lake before returning to the hotel. Dinner is on your own tonight. After another delicious breakfast, you will transfer to Röthenbach, Germany (1 hour). Upon arrival, enjoy a spin along the Bodensee-Königssee Bike Route, a mostly downhill reel to Lindau brimming with lush green pastures surrounded by mountain streams and breathtaking views of the Alps. You pause in Heimenkirch for a home-hosted lunch. Later, you follow the shores of Lake Constance, Europe’s third largest freshwater lake. Its waters reflect heat, creating a Mediterranean-style climate conducive to growing Pinot Noir and white Müller-Thurgau grapes. Its shores are also renowned for the gardens that grace residential areas, lakeside parks, and the botanical island of Mainau. Upon arrival at this remarkable lake, you cycle onto Lindau Island where your 5-star Hotel Bayerischer Hof and its sister property, the 4-star Reutemann Seegarten (or alternate hotel on select dates), sit right on the waterfront in the heart of Lindau Island, a charming medieval town with a picturesque harbor and Bavaria’s only lighthouse. These hotels have been operated by the Stolze-Spaeth family for more than 150 years and offer a heated swimming pool, spa, and wellness center. After lunch, our longer option leaves Bregenzerwald and continues to Lindau, crossing into Bavarian Germany. Tonight’s dinner is on your own in Lindau. Across the lake in Bregenz, you may consider taking in a show at the world-renowned floating stage, a breathtaking summer opera venue. The town itself is also worth a visit, home to wood-inspired architecture, museums, and art galleries. During summer, the Bregenzer Festspiele floating stage features various performances. Tickets can be purchased at http://bregenzerfestspiele.com/en months in advance. A ferry to the show can be booked from Lindau to Bregenz at www.bsb.de/schiffstransfer.html or through our Lindau Hotel. Please note that you will return to Lindau after midnight. Begin today’s reel along the lakeshore, passing the many impressive villas of Wasserburg and Nonnenhorn. Your route on this small peninsula affords lovely views of picturesque houses and a small castle before you continue on to Kressbronn and Langenargen. Coast into Friedrichshafen, a city whose history is tightly linked to World War II. Its aviation industry and strategic location made it an important center for Nazi Germany. The city was heavily bombed and largely destroyed in April 1944 by 1,086 tons of bombs. Today’s “modern” city, therefore, exudes a 1950s air in its architecture. A lighter and loftier side of Friedrichshafen’s history can be found in its modern Zeppelin Museum, housing the world’s largest aviation collection. The zeppelin airship was born here on July 2, 1900, the creation of Count Ferdinand von Zeppelin. Zeppelins took to the air once again in 1993. On a clear and quiet day, you’re sure to see them drifting quietly through the sky. Perhaps you will pause here for a refreshment in one of its many cafés. Cycle to Meersburg, a Baroque fortress town on the lake and home to the longest inhabited castle in Germany. The fortress ruins are perched high on the cliffs above, a reminder of ancient ties with the Carolingian Empire. After lunch on your own in this charming town where flowers spill from window boxes, you ferry across the lake from Meersburg, and continue cycling to your final destination in Constance. The hotel is on our biking route along the Rhine River just outside the city center, ideally located for a perfect stroll into town later this evening. Explore the city and enjoy dinner on your own at one of the great local restaurants nearby. This morning, take a short train ride to St. Gallen, Switzerland, located near the point where Switzerland, Austria, and Liechtenstein meet. The city has been a major religious center since the seventh century. A guided tour of the Abbey of St.Gallen reveals the treasures of the baroque cathedral with its fantastic ceiling frescoes. For centuries, this was an Imperial Benedictine Abbey and a center of Western science, art, and high culture. The rococo Abbey Library, equally ornate, is the oldest in the country and one of the world’s most significant monastic libraries. Later, stroll the traffic-free Old Town replete with brightly painted oriel windows, pretty boutiques and world-famous embroideries. Back on your bicycle, enjoy a scenic spin to the charming Swiss village of Steinebrunn, where you stop for a traditional Swiss lunch at a local organic apple farm. Afterwards, continue your ride back to Constance, where you have more time to explore this beautiful city on your own. You might find this to be the prettiest, most cozy corner of Lake Constance, the perfect place to end your journey. Tonight, we raise a glass and say “prost!” to a magnificent week during a festive farewell dinner. VBT Air Package and Post-Trip Extension guests: Remain another day in Constance to explore on own. We highly recommend a visit to Mainau Island, nicknamed locally “Blumeninsel,” or the flower island. This 111-acre, pedestrian-only private island is a lavish display of plants and manicured gardens, blossoming in tune with the seasons. A Baroque castle with a church featuring notable artworks marks one end of the island, and inviting trails crisscross its length. Tulips, orchids, and rhododendron burst in a riot of color in May, followed by 350,000 other blooms, plus potted plants and fuchsias. Dahlias and roses arrive in September. It’s a feast for the eyes that will enchant even the most seasoned gardener. You may also visit the falls of the Rhine River in Schaffhausen, Switzerland, accessible by boat or train from Constance. Embark a ferry from the harbor in Constance to Schaffhausen, then return later in the day by train. These are the largest falls in terms of water volume, in Europe. Thermal bath lovers might want to take the waters at the Bodensee Thermalbad in Constance. The infinity pool overlooks the lake and the hi-tech water features and jets do wonder for biking muscles. The perfect place to relax for an afternoon. The alleys and squares of Constance’s old town are lively and bustling. For a bird’s-eye view, ascend to the top of the Münster church. For a few euros, you can walk up the stairs and look through the telescope across the lake to many of the destinations where you cycled this week. You’re also sure to find myriad keepsakes in charming shops. If you’d like to take in some local culture and history, Constance boasts museums, galleries, and historic buildings. If you have not had enough cycling, you may rent cruiser bikes from a small bike shop across the street from our hotel. The shop owner can suggest routes to suit your desire. After breakfast* this morning, transfer to the Zurich airport (approximately 50 or 60 minutes, depending on traffic) for your departing flight **. Please ensure you are ready in the hotel reception area at the designated time. **Please note: VBT recommends that you check your transfer time in your “Transfer Reminder.” VBT transfer times and departure points are finalized in advance and cannot be modified for individual guests. If you extend your stay beyond the scheduled departure time, return transportation to the airport will be at your own expense. VBT Bicycle Vacation Only guests: Meet your VBT representative and the rest of the group in the lobby of the VBT Munich hotel (Hotel Stadt Rosenheim, Orleansplatz 6a, 81667 Munich, Germany. Tel.+49 89448 2424) before 9:00 a.m. for a prompt departure by motorcoach. Your VBT representative will be holding a VBT sign and will be easy to recognize. From Munich, transfer to the village of Hohenschwangau near Füssen (1 hour 45 minutes). Please bring your cycling clothes (including your pedals or saddle if you use your own) in your day pack, to change into before beginning the warm-up ride. Meet your VBT Trip Leaders at approximately 10:45 a.m. in the village of Hohenschwangau near Füssen. From here, hop on the local bus (2 km) up to Neuschwanstein for your included 30-minute guided tour of the castle. Afterwards, return to the village by local bus and shuttle to your hotel in Füssen. Enjoy an included light lunch before your bike fitting and warm-up ride. Should you miss the transfer from Munich, please arrange to meet your Trip Leaders and the rest of the group in the lobby of our hotel in Füssen at 12:30 p.m. (Hotel Hirsch Füssen, Kaiser-Maximilian-Platz 7, 87629 Füssen, Germany. Tel: +49 (0) 8362 9398 0; or Hotel Das Rübezahl, Am Ehberg 31, 87645 Schwangau, Germany. Tel: +49 (0) 83 62 8888. Please refer to your Final Travel documents for your Füssen hotel.). A direct train from Munich to Füssen takes a little over 2 hours and costs about $33-$75 USD per person. If your arrival at the hotel is scheduled later than 12:30 p.m. or if you are delayed, please contact the Hotel Hirsch or Hotel Das Rübezahl to advise of any travel delays or changes, and the staff will pass your message on to your VBT Trip Leaders. Please note that you will miss the included guided tour of Neuschwanstein. Please note that check-in time is 4:00 p.m., and your room will not be ready. You will be able to leave your bags with the reception desk. The enchanting Old-World town of Füssen, located in the foothills of the Alps and at the southern end of the Romantic Road, is nestled in one of the most breathtaking natural settings in the world. 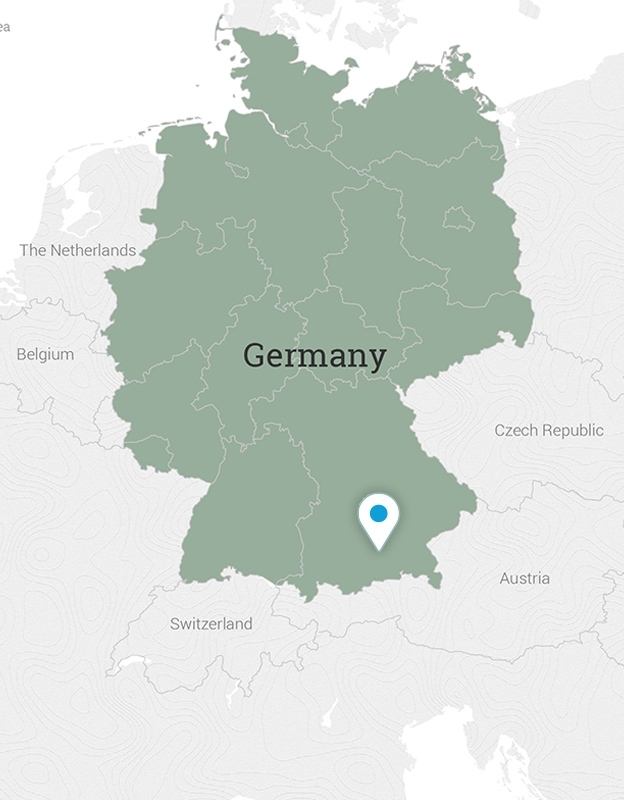 At 2,651 feet in elevation, Füssen is the highest town in Bavaria. Looking south, you will glimpse the peaks of Austria. VBT Bicycle Vacation Only guests: After breakfast, meet your local guide at 9:00 a.m. for a one-hour walking tour of Constance. Afterwards, you are free to continue on your own. From Constance, there are many train connections to other cities in Germany and Switzerland. Or you might embark the catamaran that whisks you across the lake to Friedrichshafen from where you may continue by plane or train to your final destination. The beautiful Hotel 47 Grad is located in the blossoming neighborhood on the north side of the Rhine. The hotel looks out over the Rhine River as it flows out of Lake Constance and is located directly on VBTs bike path. The interior of this brand-new property has a decidedly modern atmosphere with an excellent breakfast spread. Just outside the hotels doors, the bike-and-pedestrian path takes you over a small bridge and into the heart of the Old City. The 5-star Hotel Bayerischer Hof and its sister property, the 4-star Reutemann Seegarten, are right on the waterfront and promenade of Lake Constance, in the heart of the historic city of Lindau. Operated by the Stolze-Spaeth family for more than 150 years, each offers generous amenities to make the close of each day truly rewarding. Stroll the lovely gardens, take a dip in the heated swimming pool, relax in the wellness center, or unwind with a drink on the lakefront terrace café and bar, with fresh breezes coming off the lake. Rooms are non-smoking and spacious, with free WiFi connections. Set in a scenic countryside amidst alpine splendor, the 4-star Art Nouveau Hotel Hirsch has been run by the same family for four generations. Enjoy a unique blend of elegantly modern comfort and traditional Bavarian ambiance during your stay. Indulge in the hotel’s fine dining in their classic restaurant. enjoy a delightful meal in the traditional Bavarian pub or relax in the authentic setting of the beer garden. Each spacious room has been stylishly refurbished for your utmost comfort and includes free WiFi connections. This design hotel in Munich is across a park from the Ostbahn, the metro stop that whisks you to the Marienplatz, Munichs main square, in just five minutes. Built in a historic building, the Hotel Stadt Rosenheim underwent total renovation in 2010, with many of its Art Nouveau features retained. It rests on the beautiful and vibrant Orleansplatz, lined with cafés, restaurants, art studios, and shops. Each room is elegant and stylish, mixing a traditional sensibility with a modern touch to create a warm, welcoming feeling. Throughout, guests can access free WiFi. However, as the building is listed in the city as a cultural monument, it is not equipped with air conditioning. Arrive at the Munich airport, where a VBT representative will meet you and help you transfer (approximately 40 minutes) to your centrally located hotel. The rest of the day is free to explore and dine on your own, using the VBT City Information as your guide. The area is full of options for dinner. A VBT representative will meet your group outside the breakfast room of the hotel at 9:00 a.m. to answer questions and help you organize your time in Munich. After, you may join a short excursion with our representative to help you get acquainted with the public transportation system, taking the subway to the Marienplatz. There is a small cost for a daily or three-day transportation pass. After helping you get oriented, your VBT representative will leave you at the Marienplatz to explore on your own. At 11:00 a.m. and noon, the Marienplatz fills with onlookers as the Rathaus clock strikes the hour to a parade of figurines, including trumpeters, dancers, and horsemen. Close by, the Peterskirche, the oldest church in Munich, is notable for its grisly relics of St. Munditia, patron saint of single women. If you wish, you climb the several hundred steps up the tower for magnificent views. The Munchener Stadtmuseum is an excellent local history museum that includes a photo and film exhibit and a puppet display. North of Marienplatz stretches the posh end of the city center. And from the fashionable Maximilianstrasse, the little Kosttor road leads straight to the Hofbrauhaus, Munich’s largest and most famous drinking hall. You might also head north of the city to the English Garden, Munich’s largest natural area. Its pretty vistas draw thousands of visitors for walks and picnics. Perhaps take a swim in the rivers that run through the gardens or stop at a popular beer garden for a refreshing break. Air Package guests will arrive throughout the day. You’ll have time to explore more of Munich and its surroundings on your own. You may visit the interesting BMW Automotive Museum, which chronicles the history of the company in relation to the development of the modern automobile. Exhibits, videos, slide collections, and films tell the story. Nearby, visit the neighboring Olympic Park, the site of the 1972 Olympic Games. Walk through the lovely grounds, visit the modern and mesmerizing stadium, and enjoy astonishing views from the Olympic Tower. Or you may wish to venture out of Munich. The Dachau Concentration Camp and Memorial Site is on the northern edge of the city. Today, Dachau Memorial Site is a place of memory and pilgrimage and makes for an educational and sobering day trip. VBT travelers have recommended day tours organized by New Europe’s Munich Tours (www.newmunichtours.com). You can reserve all these tours online or through your hotel upon arrival. After breakfast, transfer by private minibus (approximately 1 hour) to your beautiful and centrally located hotel in Zurich. You’ll arrive at approximately 10:00 a.m. And you will meet your local Zurich guide in the lobby of your hotel for an included city walk to help you get acquainted with the city. Enjoy the rest of the day to explore. Continue your independent exploration of the city and nearby area. After breakfast* this morning, transfer to the Zurich airport (approximately 30 minutes, depending on traffic) for your departing flight**. Please ensure you are ready in the hotel reception area at the designated time.